Repair unable to boot VM after a successful P2V to VHD format with NovaBACKUP (if the VM is Windows Server 2008 and above Server OS). 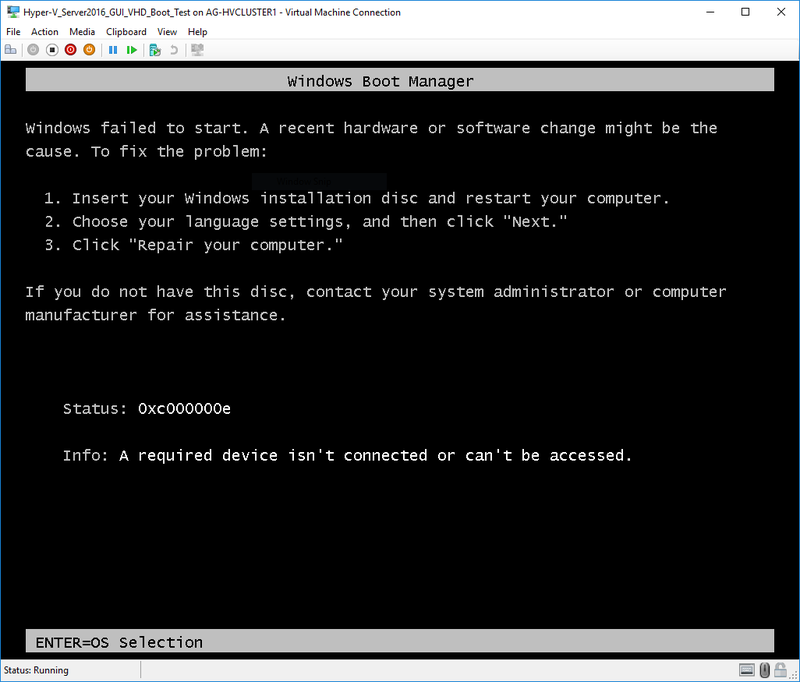 This method requires having installation media for Windows Server 2008 or above (.ISO image or DVD disc) on hand to be able to assign that installation media to the VM that is unable to boot in order to perform the repair. NOTE: If you cannot obtain or locate a Windows installation media to utilize for this purpose for whatever reason you can utilize the alternate guide that we have to repair the VM which does not require any sort of installation or boot media to be on hand and allows the repair to occur from the Windows Hyper-V Hypervisor server directly after mounting the VHD in question on the Hypervisor server. That alternate guide is Repair unable to boot VM after a successful P2V with NovaBACKUP and BCDBoot (for Windows 7, 8, 10, Server 2008, 2008 R2, 2012, 2016). 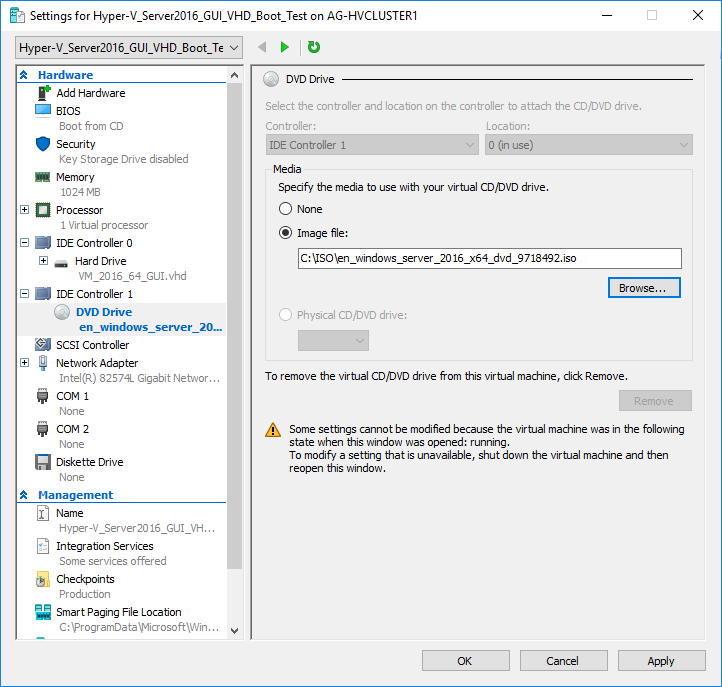 So, you perform a successful Physical to Virtual (P2V) with NovaBACKUP using the Image Backup to VHD (Microsoft Virtual Drive) method or have used the Image Backup (.NDF) to VHD method. All is well until you boot the new VM and it FAILS to boot. For those situations where you simply get a black screen with a title of “Windows Boot Manager” stating that “Windows failed to start. A recent hardware or software change might be the cause”, maybe with a blinking cursor but no Windows load, there are two solution methods to take to get the VM to boot again. (If you are experiencing a blue screen this article is not for you). First, do not fear the black screen. It simply means the path to load Windows cannot be found by the boot loader. This may be due to the boot loader, or it may be due to the MBR or Boot Sector. Let’s just say we aren’t concerned with all the technicalities and want to fix it. Here’s how. Instructions for if the VM is a Windows Server 2008, 2008 R2, 2012, and 2016 server OS. We’re going to fix the entire boot path, despite what part of it is broken. Locate an ISO or DVD of the installation media for any of the operating systems listed in the title above, it does not matter which you choose to use from the list as they are all compatible. Prepare your VM to boot from this installation media. We’re going to use the Recovery Console. We’ll assume you are using the Windows Server 2016 installation media. Save the changes and then start the VM. Press a key when you are prompted with the “Press any key to boot from CD/DVD” text, the OS installation disc or image will load up. Now depending on the OS that you are using the repair screen will differ from these instructions but basically you need to get to the Command Prompt in the VM to perform this repair. Click Next, then “Repair your computer”, then click Troubleshoot. bootrec /FixMbr (Fixes the MBR - Master Boot Record). The output of the command will need to state "The operation completed successfully". bootrec /FixBoot (Fixes the Boot Sector). The output of the command will need to state "The operation completed successfully". If you receive an access is denied message on this step please follow the guide here. bootrec /ScanOS (Detects installed Operating Systems to repair) - This command attempts to detect the installed Operating System(s) to be able to then run the next step to rebuild the entire boot environment). The output of this command will need to state "Total identified Windows installations: 1", and not "0". In order to execute the next step in this guide, the output of the command will need to state that it did detect at least one Windows installation. 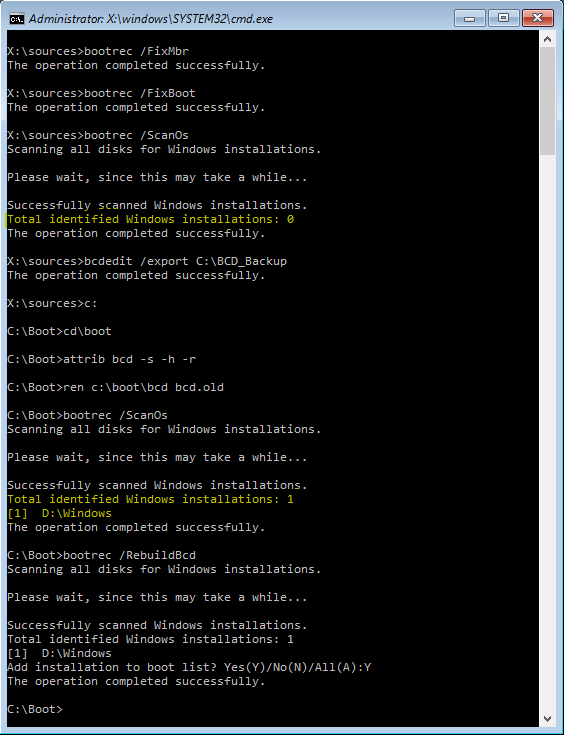 bootrec /RebuildBcd (Rebuilds the entire BCD - Boot Environment). For this command to have actually worked it needs to prompt you to "Add installation to boot list? ", and it will state answer Yes(Y), enter Y and press enter there. If you are not prompted like that after executing the "bootrec /RebuildBcd" command it means that the OS was not detected. The output of this command will need to state "Total identified Windows installations: 1", and not "0", so watch for that output closely after executing this step. If "0" is displayed that means that the command actually did NOT complete to rebuild the boot environment (BCD), even though it may look as if it completed successfully. If this is the case and the output of the command showed that it detected 0 (zero) Windows installations then you will be required to proceed directly to Step 5 below to continue the repair steps. When done you can type the word 'exit' in to the black command prompt window, or close that window that you are in that contains the typed commands, then after that click the "Restart" or "Turn off your PC" option displayed and then power back on the VM again to test it. You can now exit the command prompt session by closing the window or typing the word "exit", without quotes, in to the command prompt window. You will now be shown the prior System Recovery Options / Choose an option screen running from the boot media. You can click "Restart" or "Turn off your PC" and then power back on the VM again to test it. When you restart or power back on the VM it may come up with a black screen and prompt that defaults to the option to Start Windows Normally. Choose that option. You are now either booting into Windows, or you are not. ​View all NovaBACKUP related P2V articles here.